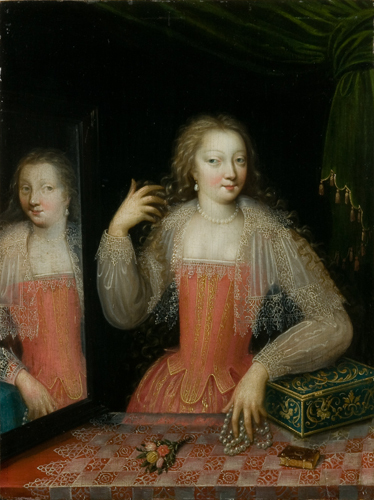 Each object included in this painting has a symbolic meaning related to the theme of vanity. The mirror and its reflected image are symbols of vanity, or excessive pride in one's appearance, as well as a warning against false appearances. The lacy tablecloth possibly refers to frivolous luxury. Flowers serve as a reminder of the short-lived nature of beauty, as fresh flowers do not last. The string of pearls, as well as the necklace and earrings she wears, warn against the accumulations of earthly wealth rather than spiritual riches. A small book often represents interests in earthly knowledge, rather than spiritual knowledge. The decorated jewelry box is a warning against the temptations of earthly wealth, rather than the accumulation of spiritual riches through good works.